Once you finish your basement, you're going to be spending a lot of time enjoying your new space. As is the case with any other living area, it's important to feel safe and be safe at all times when you're there. If you have an emergency in the house, such as a fire upstairs, you will be much safer with more than one way out of the basement. Adirondack Basement Systems offers the ScapeWEL Window Well System as a way to make your remodeled basement safer, more beautiful and code complaint. 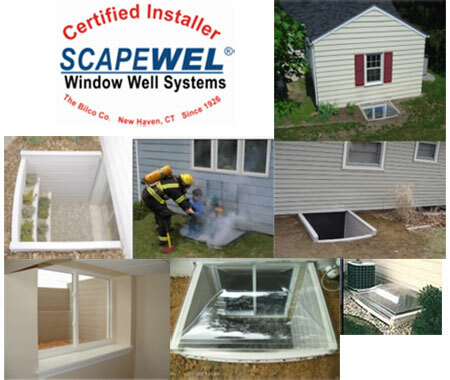 ScapeWEL Window wells are made of a high-density, blow molded polyethylene and are filled with a rigid setting, closed-cell polyurethane foam that adds strength and rigidity to its structure. Made out of completely inorganic material, they will never rust, chip, rot, or become a habitat for termites or mold. They're highly resistant to dents and scratches and are equipped with UV stabilization protects its color from fading and further enhances their long life. The most exciting feature about the ScapeWEL Window Well is how beautiful it makes our basement living space! The ScapeWEL makes your basement window wide open, allowing daylight into your basement and adding natural beauty and comfort to your remodeled basement area. 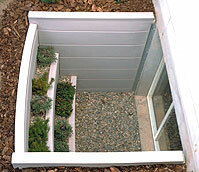 The attractive, bright color of the ScapeWEL Window Well will brighten the area and reflect sunlight into your home. The terraced steps of the ScapeWEL can be planted with your favorite flowers and shrubbery to further take advantage of its beautiful design! To make your finished basement code compliant, it must have at least two exits overall and at least one exit in every bedroom. As a matter of fact, the International Code Council states that all basements with habitable space and every sleeping room shall have at least one openable emergency escape and rescue window or exterior door. The ScapeWel combines perfectly with EverLast™ Egress Basement Windows to make a code complaint escape route that increases the value of your home. If you need to install an additional escape route in your basement, there is no option as attractive and cost-efficient than to install EverLast™ Egress Basement Windows with a ScapeWEL Window Well System! Call or contact Adirondack Basement Systems for a FREE Basement Finishing Estimate Today! Adirondack Basement Systems offers Free Estimates on ScapeWel window well systems in Schenectady, Albany, Troy, Amsterdam, Saratoga Springs, Clifton Park, Queensbury, Gloversville, Latham, Ballston Spa, Cohoes, Johnstown, Rensselaer, Hudson, Mechanicville, Hudson Falls, Ballston Lake, Delmar, Glens Falls, Gansevoort, Waterford, Watervliet, Catskill, and surrounding New York areas.